An historic villa outside of Paris designed by architect Andre Bloc has two new architectural interventions by artist Didier Faustino. The visiting artist created a comic-book style burst of bright orange bricks along the villa’s façade, as well as a chandelier that mixes low energy neon with sound. Both pieces appear as part of a rotating series of temporary exhibitions that help to re-invent Bloc’s iconic compound. As if exploding out of the entrance to Bloc’s folly, This is Not a Lovesong is Faustino’s first piece, which combines sculpture and architecture. Framing the doors, the installation is made up of a brightly painted orangey-red floor and adjoining walls, one cut in the quirky style of comic book explosion. The shape of the temporary installation adds life to the once inhabited villa, suggesting movement and action in a building that was once a home and is now a stoic museum space. Made from bricks and mortar, the bright piece enlivens the lush green landscape of Bloc’s complex, while also echoing Bloc’s signature architectural style, tying present with past. Inside one of Bloc’s brick and mortar structures, Faustino’s other piece, Nowhere Somewhere, infuses light and sound into the space. 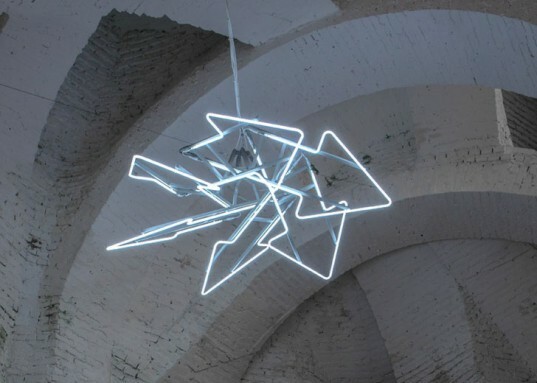 Made up of a cluster of neon arrows, the pieces point every which way to the varying exits throughout Bloc’s space. Over the chandelier, a soundtrack of three whispering voices murmur messages about not trusting the architects, meant to disorient while also referencing Bloc’s past. Both pieces were brought to the villa by curator Natalie Seroussi, who regular invites artists to the compound in Meudon. As if exploding out of the entrance to Bloc’s folly, This is Not a Lovesong is Faustino’s first piece, which combines sculpture and architecture. 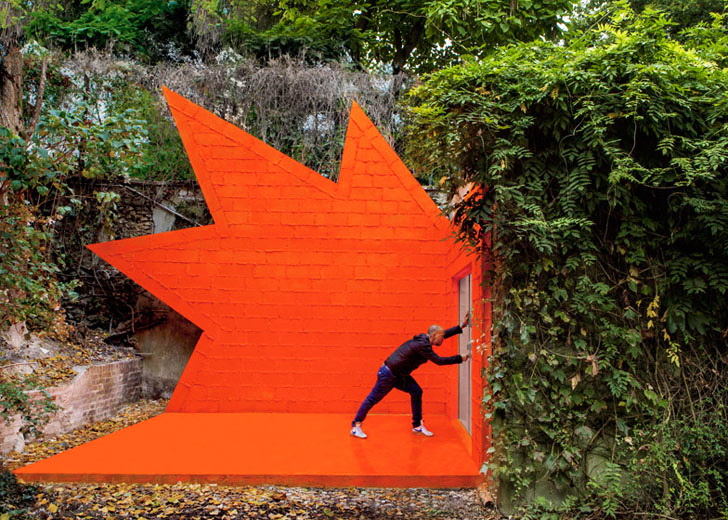 Framing the doors, the installation is made up of a brightly painted orangey-red floor and adjoining walls, one cut in the quirky style of comic book explosion. The shape of the temporary installation adds life to the once inhabited villa, suggesting movement and action in a building that was once a home and is now a stoic museum space. Made from bricks and mortar, the bright piece enlivens the lush green landscape of Bloc’s complex, while also echoing Bloc’s signature architectural style, tying present with past. Inside one of Bloc’s brick and mortar structures, Faustino’s other piece, Nowhere Somewhere, infuses light and sound into the space. Made up of a cluster of neon arrows, the pieces point every which way to the varying exits throughout Bloc’s space. Over the chandelier, a soundtrack of three whispering voices murmur messages about not trusting the architects, meant to disorient while also referencing Bloc’s past. Both pieces were brought to the villa by curator Natalie Seroussi, who regularly invites artists to the compound in Meudon outside of Paris.